The GSS has a maximum slope angle of 20 degrees from horizontal and is multi directional. The platform dimensions are 1250 mm by 1250 mm ( 4 feet by 4 feet). The horizontal position of the platform is 10” off the ground ( 260 mm). The GSS weighs 200 lbs (90 kg) and the base stands on 8 adjustable legs. The GSS is designed with safety as a priority. It is absolutely solid and won’t tip over. The base and platform are both made from aluminum. The artificial turf is 30 mm thick and the tee goes in the turf. The GSS1 is designed for open ranges and operation is manual via a panel in the centre of the platform which is operated by your food or club. The GSS2 is for golf simulators and the platform moves automatically to reflect the actual slope of the course being simulated. This is achieved through the use of the simulator software being connected to a scanner on GSS2 which directs the platform to move into the correct position. 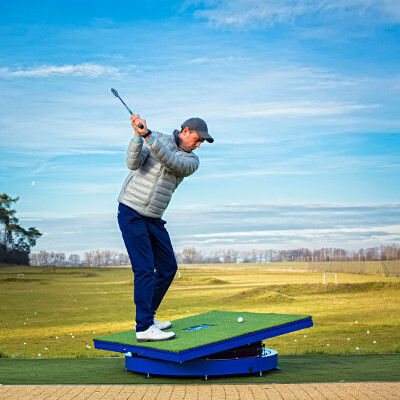 for right and left hand players for slope training on open driving ranges. Maximum weight load: 350 lbs. GSS1 operation is manual via a panel in the centre of the platform which is operated by your foot or club. 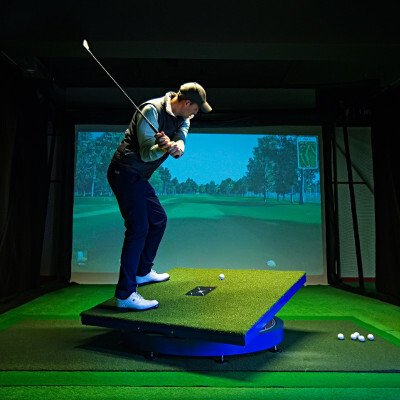 The GSS2 is designed to work with golf simulation software and screens. The platform moves automatically to reflect the actual slope of the course being simulated. This is achieved through the use of the simulator software being connected to a scanner on the GSS2 which directs the platform to move into the correct position.